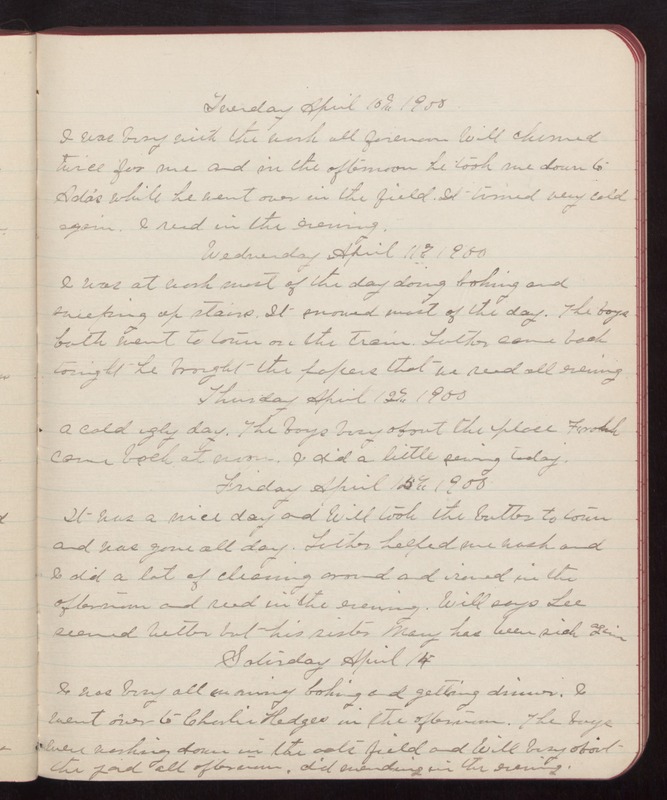 Tuesday April 10th 1900 I was busy with the work all forenoon Will churned twice for me and in the afternoon he took me down to Ada's while he went over in the field. It turned very cold again. I read in the evening. Wednesday April 11th 1900 I was at work most of the day doing baking and sweeping up stairs. It snowed most of the day. The boys both went to town on the train. Luther came back tonight he brought the papers that we read all evening. Thursday April 12th 1900 A cold ugly day. The boys busy about the place Frank came back at noon. I did a little sewing today. Friday April 13th 1900 It was a nice day and Will took the butter to town and was gone all day. Luther helped me wash and I did a lot of cleaning around and ironed in the afternoon and read in the evening. Will says Lee seemed better but his sister Mary has been sick again. Saturday April 14 I was busy all morning baking and getting dinner. I went over to Charlie Hodges in the afternoon. The boys were working down in the oats field and Will busy about the yard all afternoon. did mending in the evening.